Students from all over the world want to study in Sydney, where they can get a top quality education including English classes, vocational training, and universities, covering the complete range of academic areas, while experiencing one of the world's truly magnificent cities. Sydney is the largest and oldest city in Australia. The city is well renowned for its buzzing nightlife and is also very popular with backpackers and tourists from Europe and Asia. Sydney enjoys a relatively high standard of living not seen anywhere else in Australia. Flights to Sydney are coming in from most major international airports around the world, making traveling here even more convenient. The grand Sydney harbour, The majestic Opera House and the world famous Bondi beach culture are just some of the attractions that Sydney has to offer. Sydney is a colourful and vibrant city. Sydney is the capital of New South Wales, located on the central east coast of Australia, It is built around one of the most magnificent, and well known harbors of the world. Being one of the oldest cities in Australia, it is based on a colonial history, and has become the largest city in Australia. 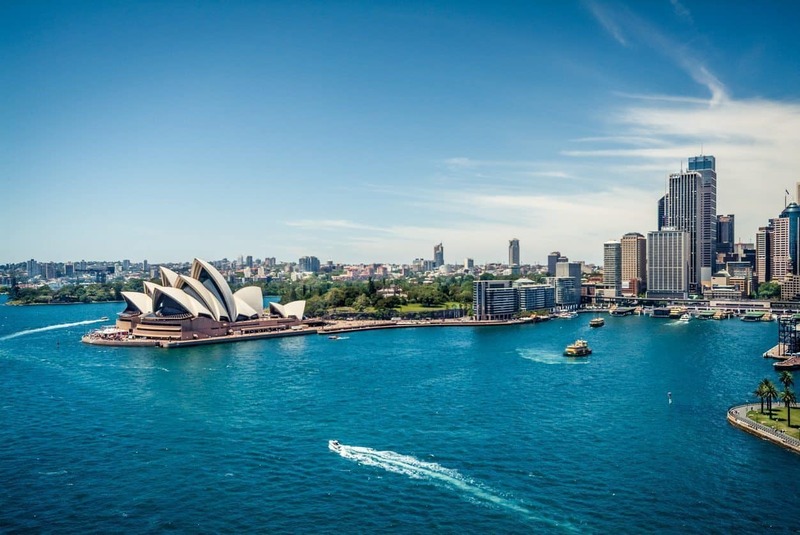 It is home to some of the world known landmarks, such as the Sydney Opera House, the Harbor Bridge, and lesser-known attractions such as Darling Harbor, Paddington, and the famous and lovely beaches Bondi and Manly. Sydney is very reputable for its Universities, both for its quality of education and for the choice of many establishments and/or levels and areas of study. Living in this city means getting more of a chance to experience business and industry, as well as being able to experience true Australian city life. You can visit the Sydney Aquarium, Opera House, Botanical Gardens and the Art Gallery of NSW all in one day! Go horse riding in Centennial Park (just 10 minutes from the CBD!). Watch a sport or concert at Sydney Stadium. Speak to our team of Education experts for free information and advice on the best study programmes for you to choose from in Australia. Sydney is in the world’s top 5. Sydney has once again been ranked the fourth best student city in the world according to the recently released QS Best Student Cities index. Helping to secure this ranking was the high quality student mix and social diversity, a good quality of life, and strong employer activity based on employers’ perspectives on the world’s best recruitment cities. Speak to us to find out how we can help you to promote Sydney as a student destination of choice. As the biggest city in Australia, many mistake it as our capital at first, in fact I'm sure many of the locals still do. Sydney is a wonderfull place to study. With so much to do and so much to see, it is a great city for social networking, lifestyle, night life and as such a huge diverse state New South Wales is fantastic to travel around. So why not experience the true Sydney? Sydney welcomes students from all over the world and all over Australia. This city offers the broadest range of courses. From short courses to bachelor degree's. They also offer a huge range in trade qualifications and agriculture courses. All major educational institutes are fully accredited, meaning they all obide by a code of conduct and ethics. All teachers have been extremely well trained with practicle and theoretical experience, to ensure they know all there is to know about which ever subject you are learning. All courses in major educational sectors will offer work placement while you are studying to ensure you have the skills that are required when you get out into the work place. As well as job placement once you have finished your course, this means once you have finished your chosen course your chosen institute will help you write resume's, cover letters, help you learn interview skills, give you a reference and will help you look for a suitable job. Australians are lucky enough to be provided with AusStudy or Youth Allowance when studying, this is a fortnightly payment from Centrelink for those eligable whilst you are studying. However this payment is only available to those Australian students undertaking a full time course. Students from overseas have to pay international student fees. Remember, you will need an International Student Visa to study in Australia if you are coming from overseas. Different educational College's can be found all over Sydney, often found advertising in local newspapers and online these are usually institutes speciallising in a specific field. Offering course's from Certificates to Diplomas and even Degrees they are an increasingly popular option for students who are either from oversea's, who are looking for a new career or to further their current career to those who are looking for another option other then University or TAFE and school leavers who have been in the work force for a while and maybe didn't complete High School or do so well in their HSC. new to the country and want to learn English even if it is from scratch. Business and Administration courses are increasingly popular within Sydney as their offer options for Receptionists, Personal Assistants through to Managment. Often this is popular for International Students as a second language is very helpfull in a Business and Commerce work environment. With flexible entry these courses often don't ask for pre - requisites but a willingness to learn. As there are few pre-requisites they have usually got a higher fee which in alot of cases needs to be paid before commencement of the course, some College's offer a weekly, fortnightly or monthly payment option to help pay off your course. These courses are offered Full Time, Part Time or online. Only the Full Time option allows the student to benefit from Centrelink Aus Study scheme. do not have. An excellent way to study in Australia. Public High Schools are well spread over Sydney suburbs. As the growth capital of Australia this city possibly carries the biggest expectations when it comes to Education, and as the Multi - Cultural hub of Australia it has the highest expectations when it comes to International Education. Sydney High Schools run from years 7 to year 12 which is usually between the ages of 12 to 18. Years 11 and 12 are known as HSC years. Where they are using their subjects to prepare for the courses or career they are choosing to take on after High School, whether this be TAFE, University or an Apprenticeship. As with all cities it has a wide eray of Schools throughout each suburb. All of which cater to International students, they offer several langauge subjects and all offer English as a mostly compolsery subject. Ranging from standard to advanced. Also offering Teacher's Assistants for extra help with students who may or may not speak fluent English, but also helping to aid the transition from school life outside of Australia to begining an Australian Education. There is also individual high schools offering education specialy for people of certain religion. As many parents and students coming from a country where religion is such a huge part of their community and their everyday lives, they may find it easier for themselves to slide into a religious based high school as it may be more acuipt to their needs and what they are looking for out of a high school education. In saying this all Sydney public high schools will offer a religion subject mostly running in the earlier years, and can usually be carried on as an elective subject when they get to years 10, 11 and 12. Sydney is such a diverse city with people living there from all over the world, All of these schools will have children from different continents and will be cattered to all of their individual needs. Some universities offer an International Post-graduate Scholarship, offering those with exceptional marks a more financially friendly way to study. As moving to a different country can be a very financially draining option, Sydney Universities offer these scholarships as a way to help the financial burden which can be placed on families. As paying for visa's, accomodation, transport, books, study fee's and the rest. We are proud to offer our exceptional international students a scholarship option. In Australia we also offer what is known as Os-Help which is a financial service offered from our government to International Students. To help cover the cost of study fee's. Whilst studying Full Time in Australia you can also claim Aus Study which is also a financial aid. Most Degree's go for three to four years, with options to further your studies after succesfull completion of your course. All campus's offer student services, langauge aides and translators, computer and study areas, library's, career guides and student counsellors. Sydney is a fantastic place to live and study. Sydney has so much on offer when it comes to further Education. TAFE is one option, it offers Certificate to Diploma courses with few pre-requisites. It is most commonly an option for students who may not have done as well on their HSC, they will usually decide to undertake a course at TAFE to help bridge into a degree that they are wanting to complete at University. you would have already completed through TAFE. Also used for Mums re-entering the work force, for people looking for a change in career and for student from oversea's looking to enhance their skills so that they are more relevant to work life in Australia. Along with this TAFE offers a number of short course offering courses from First Aid, to Arts and Craft and even Language and Computer skills making TAFE studies a very popular option with students who have just recently moved to Australia. There are currently eight TAFE centres across Sydney. Offering a range of different courses, these can be studied Full Time or Part Time at the institute during the day or at night. Many subjects also offer a study via correspondence option how ever this isnt available for all courses. Sydney TAFE offers services from career counsellors, through to job placements and they often have an internship program for international students. Upon graduation of your Certificate or Diploma course tutors will offer references and help you with your Resume's and Cover Letters as well as helping to find a job in your chosen field. TAFE is an extremely popular study option within Australia and New South Wales. It is a great way to begin a career and learn new skills which will be required when working in Australia. Sydney has such a huge range of further education options, offering so many course options, study options and well educated teachers. There are five major Universities in Sydney and even more within the whole of New South Wales. University is the highest study option in Australia offering Bachelor Degree's, up to Masters. All of the five main Universities in Sydney offer places for international students, many offer on campus accomodation with meal rooms, study rooms, library's etc. Sydney has some of the most beautifully presented Universities in the whole of Australia, with world class facilites and fantastic Teachers and Tutors it is a friendly and productive place for anyone to study. Sydney can probably be said to be the most popular city in Australia, it has a very high population actually been the most populated city in Australia to undertake an English course. With many people moving to Australia from overseas every day most of which move to Sydney, New South Wales there is one thing this city must offer. This being a school that teaches English. Sydney has a number of ways in which you can study English. One of which is by using or going to a Langauge School. Most of which do specialise in teaching English to people who have recently moved to Australia from over seas. In total there is Twenty - Two Language Schools within Sydney, you will require a Student Visa to stay in Australia and are not allowed to undertake Employment during this period. At all of the schools there will be translators readily available, whether via phone, as a teacher or available through the school. Depending on how much or how little English you already know, there will be different levels of English programs running, and tutors ranging from qualified teachers to graduate Australian University students. Alot of these Schools offer online courses, home tutors and an internship program where you are offered an internship to come and study within Australia. They also can offer whats known as 'English Home stays' where there are deals where you come and stay in a Teachers home for a certain amount of time and undertake an English course. At the end of completion of an English Language course you are given a Certificate which can act as a credit to get into TAFE or University if you decide to continue an education within Sydney or anywhere else in Australia. With so many different ways to explore and learn the English langauge, and as a widely spoken language throughout the entire world, this would be a huge opportunity that will open windows for your life and career in Australia. There is no better place to start your life in Australia then Sydney, as it has a great diverse multi - cultural population and no better place to start a course in English. Studying in another country is surely the ultimate combination of life-styles. The quintessential University experience of meeting fresh minds with fresh ideas and getting drunk with them at the university bar, plus seeing the sights of a whole new country. But how to make the most of it? You don't want to miss the opportunity of being in another country by spending too much time cooped up in doors. Sydney has several international level Universities that accept overseas students. It is also frequently near the top of the list of best cities to live in worldwide. A combination of vibrant night life, great food, abundant art and culture, as well as the amazing beaches makes it a little too easy to skip a study session for some recreational activity with your new home. But in a new town it is easy to get a bit lost. Fortunately, the major Universities are fairly centrally located. The University of Sydney main campus, UTS and Curtin University are just a few hundred metres from each other, on one of the main streets in Sydney, Broadway. And both of these are a short walk from Central Station, the hub of the railway in Sydney, connecting all suburban networks as well as the rural trains. The countryside is not far away. The University of New South Wales is on the Eastern side of the City, towards the beaches. It is a short bus ride to several of the major southern beaches of Sydney. If you like the beach, if you really like the beach, then do yourself a favour, avoid Bondi! If you want over-priced and bad food, dull tourist traps, hawkers, and to be surrounded by other foreigners slowly turning pink under the sun AND a crowded beach, then by all means go to Bondi. World fame means everybody wants to go there, so maybe check it out once and then head down to Coogee, Clovelly or Bronte beach. Each of those provides a much calmer, cooler, and genuine Australian beach experience. But if you're serious about beach action, then the Northern beaches are where it's at. I'll tell you about those next time. And if you think about moving to Australia, just write to us.